Over the weekend I was up in Toronto where my two sisters live. While there I made a pilgrimage to the Art Gallery of Ontario, the city's major museum. My sister Kathy years ago began sending me postcards of the early 20th century Canadian landscape painters. I didn't particularly like them at first as they seemed a little too abstract and over generalized. But over time they worked their magic on me and won me over. On Saturday I only had time to focus on a couple of galleries at the museum so I made a bee line for their Lawren Harris rooms, my all time favorite of Canada's painters. 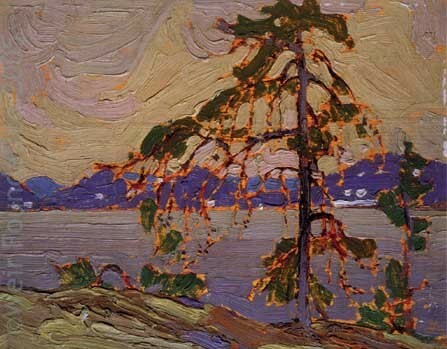 But next door were some truly wonderful oils by Tom Thomson, a precursor of Harris and his Group of Seven. Above is one of the most famous of all Canadian paintings, Tom Thomson's The Jack Pine (it lives over in Ottawa at the National Gallery of Canada). Below is the plein air oil Thomson made that he used as a basis for the larger studio painting. Looking at the two side by side is fascinating. See how he decides to describe the tree with larger and simplified masses of pine needles. Leaving the delicate intricate textures of the his smaller study's limbs behind, he opts instead for fewer but larger shapes. He still however keeps those empty thin branches hanging down (which I just love!). The entire tree is pushed darker, as are the far hills. The color adjustments are tuned in a more simple direction- everything except the far hills are nudged into warmer colors so that those hills can pop out as the one bright area of cool color. What's going on I believe is Thomson wanted a stronger supporting cast for his star actor, the Jack Pine. So he's re-written the part for the far shore, giving it more lines to read in the play. The study was more about the tree. The completed studio oil is about the tension and contrasting characters of that tree against the distant shore. He makes the painting way better. Here's another Thomson, Pine Island, Georgian Bay, one I'd not seen before. Like the previous works, it's the familiar "trees against the sky" motif. But this one couldn't be more different in feeling. 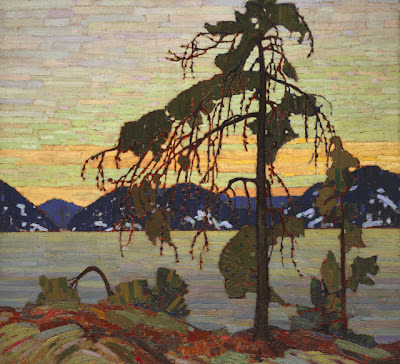 Where the Jack Pine expressed an elegant stillness with its small branches hanging straight down, this one's all about the rushing wind. If you squint your eyes at it you sense the way Thomson groups his dark branches together like geese flying in tight formation. 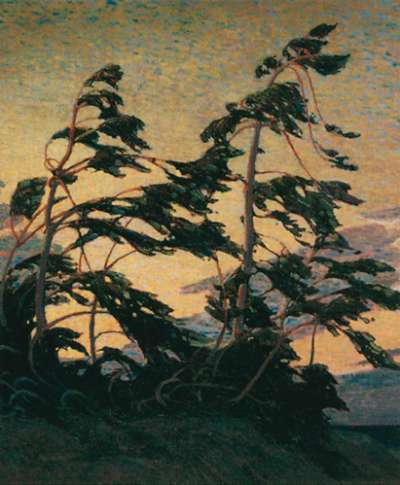 The final thing I wanted to say is that looking at both the Lawren Harris and the Thomson paintings at the Art Gallery of Ontario, I was struck by how these artist almost never painted completely empty skies. Whether they resorted to big blustering volumetric clouds or just wispy traces of brush strokes, these painters were decidedly in the "put SOMETHING in the sky" camp. Often Thomson and the later Group of Seven are written about as having simplified the landscape as they painted it. Compared to the 19th century painters that's pretty much true. But they didn't go all the way with this idea either. Rather they stopped halfway, delicately balancing the needs for elemental dramatic compositions with their love of pattern and decoration. It is sad so few Americans know about these Canadian painters. At their best they're right up there with Grant Wood, Edward Hopper , and Rockwell Kent. Perhaps some far sighted American museums will do shows of their work someday. Right now I'd wager it's impossible to find a Group of Seven painting hanging in an Amrerican museum. That's a pity. I sheepishly have to admit that had it not been for my sisters' heading off to Canada 40 years ago, I might not have learned of them when I did. Marcia, yes aren't they great!